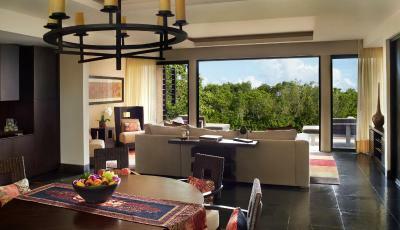 Lock in a great price for Banyan Tree Mayakoba - rated 9.5 by recent guests. Extremely friendly staff , always having a smile on them , helping u with whatever u need . It is amazing! The villa, staff, and grounds were perfect. The restaurants on site have the most amazing settings, but the food is expensive, but very good. The beach had some seaweed washing up, but there was a crew there picking it up. They also had a trained hawk to scare away pesky seagulls. This is an amazing place! Everything is perfect down to the smallest detail! If you want to take a rest, this hotel is the right one. The villa is good isolated and the pool, jakuzzi are nice. The bed is very comfortable. Bathroom is nice. You are in the middle of the nature. Staff at Bayan Tree are so lovely they will help you with anything you need and really go the extra mile. We loved having a private pool and garden with our room!! Rooms are very large, private plunge pool off the bedroom, chaise lounge/day beds in villa yard, bikes provided to get around the property (or golf cart pickup). Love this resort, this was my 2nd time to go. It is very expensive, but worth the splurge. The best resort I have ever stayed in! And we are quite frequent travelers. Everything was perfect, our vacation was like a dream thanks to Banyan Tree! Located 6.2 miles from downtown Playa del Carmen, this 5-star resort features luxurious villas, each with a private pool and landscaped garden. 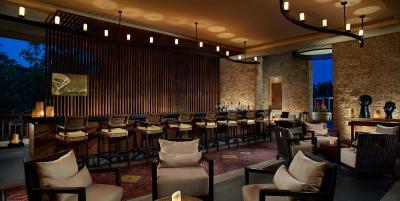 It offers 11 specialty restaurants serving international cuisine and 3 bars. 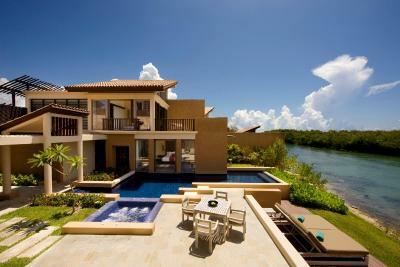 Each spacious villa at Banyan Tree Mayakoba in Riviera Maya has an expansive layout which includes a private sun terrace. All villas include a large bathroom, walk-in closet and iPod docking station. The living room has a 42-inch flat-screen TV and free WiFi. 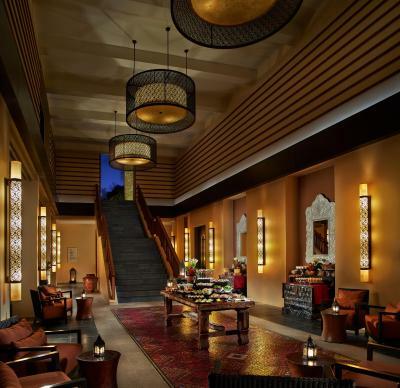 Mayakoba Banyan Tree offers international cuisine, including Thai specialties at Saffron. Reflections Bar serves cocktails and snacks by the communal outdoor pool. 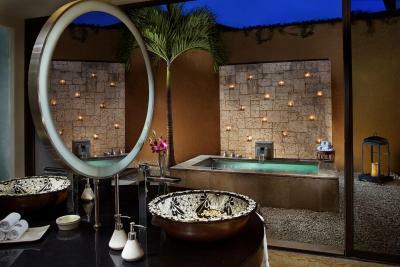 Banyan Tree Spa is a full-service spa, including massage and body treatments. 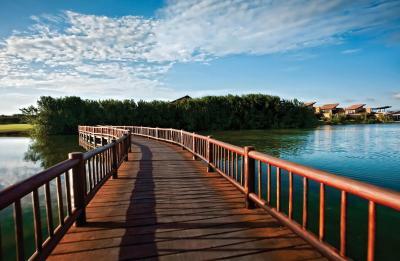 Guests of Banyan Tree resort can work out in the gym or enjoy a mangrove boat tour departing from the lobby. 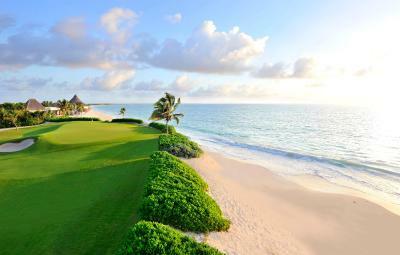 El Camaleón Golf Club, opposite the resort, provides lessons through the Jim McLean Golf School. 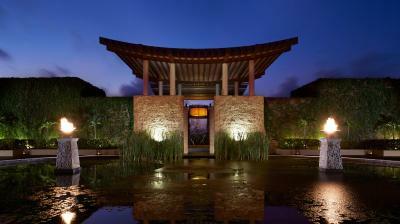 Cancun International Airport is a 45-minute drive from the Banyan Tree Mayakoba resort. 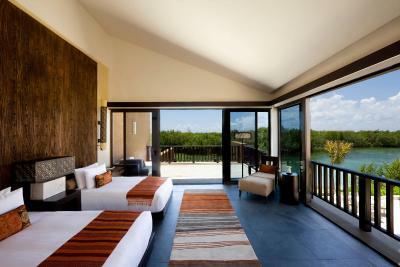 Banyan Tree Mayakoba has been welcoming Booking.com guests since 3 Feb 2011. 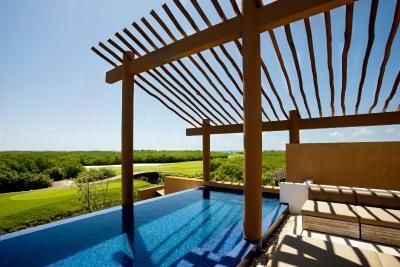 When would you like to stay at Banyan Tree Mayakoba? 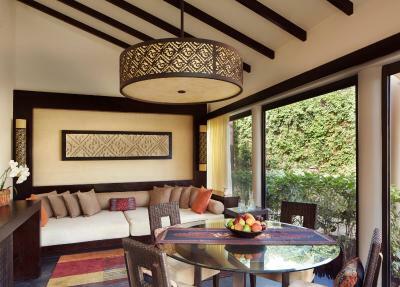 This villa features soaring ceilings and it is tastefully furnished with Mayan-inspired bed, lamps and talavera earthenware sinks. There is a living and outdoor dining areas, a spacious bathroom and a private landscaped garden. It has its own outdoor bathtub, a private swimming pool and an outdoor terrace. This villa is equipped with separate living and study pavilions and tastefully furnished with Mayan-inspired bed, lamps and talavera earthenware sinks. It has a living and outdoor dining areas, a spacious bathroom and a private landscaped garden. There is a private swimming pool and outdoor whirlpool. 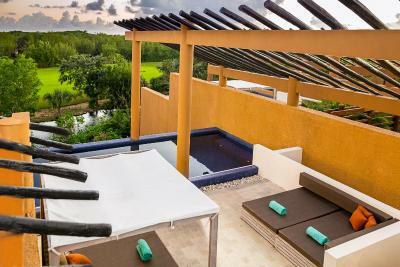 This 2-story villa features a romantic ambiance and features outdoor showers and a personal outdoor area equipped with massage beds, chaise lounges and a dining area with Mayakoba’s lagoons views. It has a spacious bathroom, a private landscaped garden, private swimming pool and an outdoor terrace. This 3-story, 3-bedroom golf view residence offers peaceful, secluded spaces surrounded by lush, untouched nature. It features a sun-drenched roof deck lounge, a private pool, outdoor dining area and magnificent views of the golf course. 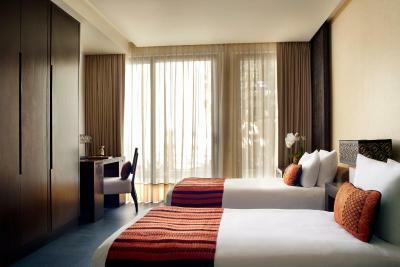 It also comes with spacious living area equipped with large LCD TV, dining room and sunny balcony. The master bedroom comes equipped with a king-sized bed, LCD TV and bath tub, while the second and third bedrooms contain a queen and two twin beds respectively. All three bedrooms come with full private bathrooms. Located steps away from the glimmering white sands and radiant turquoise waters, this tastefully furnished villa with Mayan-inspired beds and spacious bathrooms featuring talavera earthenware sinks has elegant décor and views of the garden and the pool. 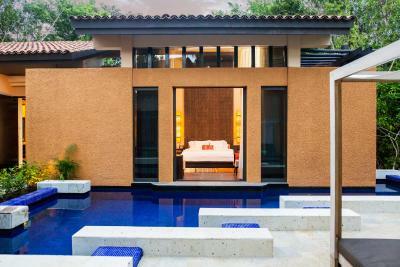 This villa opens to a garden with convenient access to the main lobby and Saffron restaurant. 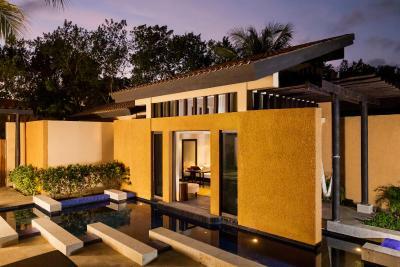 Designed for up to 4 adults, each villa is tastefully furnished with Mayan-inspired beds and spacious bathrooms featuring Talavera earthenware sinks. 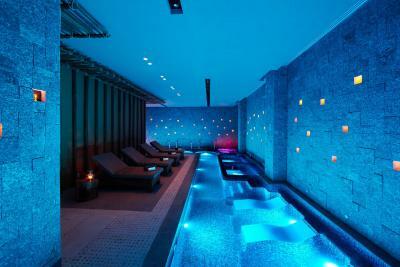 The garden boasts a heated swimming pool and bubbling jet pool. The rooms have their own separate entrance. This 2-bedroom villa offers a private pool and is located close to the beach. 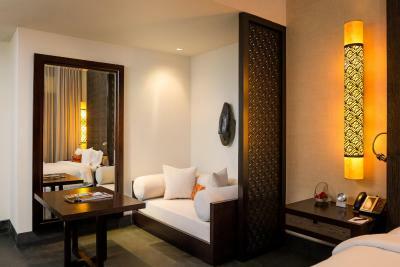 Each villa is tastefully furnished with Mayan-inspired beds and spacious bathrooms featuring Talavera earthenware sinks. 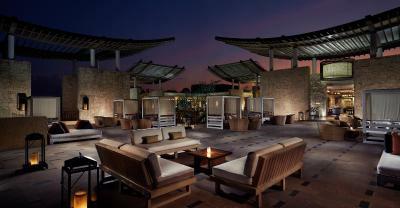 Guests will be able to enjoy of a landscaped garden with a heated swimming pool and bubbling jet pool. Each accommodation has its own separate entrance. 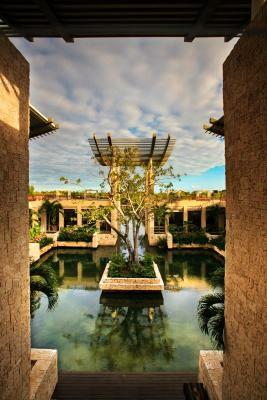 Banyan Tree Mayakoba is a site of almost mythical beauty. It flawlessly blends elegance and nature, taking the Caribbean lifestyle to an unprecedented new height. A breathtaking getaway for relaxation, rejuvenation, romance and world-class dining, it is also the region’s most sustainable five-star resort. 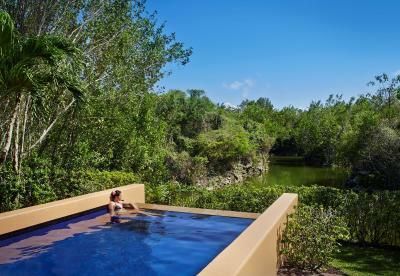 Banyan Tree Mayakoba offers 116 villas, ranging from romantic Bliss and Serenity Pool Villas to Family Residences and Ocean Front Villas. All include outdoor areas with private pools and terraces. Inspired by the interior courtyards of houses in the Far East, each villa is discreetly built to blend with the landscape, integrating the interiors and their idyllic surroundings. 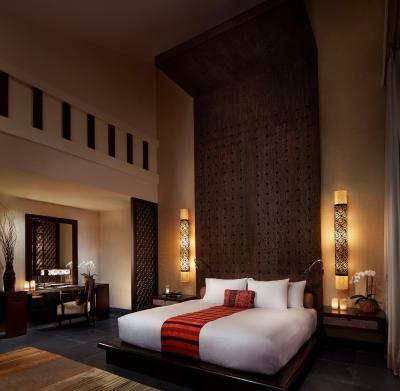 With its revitalized culinary concepts, Thai-inspired therapies at the Banyan Tree Spa, 14 event-venues and the Greg Norman signature 18-hole El Camaleón golf course, home to the PGA Tour Mayakoba Classic, the resort raises the bar for premium leisure options and event planning. 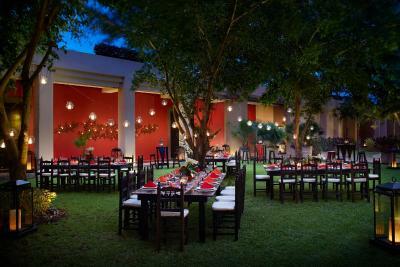 House rules Banyan Tree Mayakoba takes special requests - add in the next step! All further older children or adults are charged USD 150 per night for extra beds. Banyan Tree Mayakoba accepts these cards and reserves the right to temporarily hold an amount prior to arrival. Note that children over six years old will have to pay 50% of adult breakfast. Guests can request an airport transfer for an additional cost. Please contact property directly for further details. A Municipal Environmental Tax of $10.00 Mexican Pesos will be charged per villa, per night and is to be paid upon check in. On January 1, 2018 this tax will be increased to $20.00 Pesos per villa, per night. Extraordinary service at check-in by our resort host David, dining reservations by Denny, prompt cart pick up’s to beach, tennis, etc. ; excellent choice of restaurants and menu - fantastic spread at breakfast buffet, wonderful amenities and service all around. The staff were fantastic and would definitely recommend a stay to anyone. Time to do some light upgrades in the villa bathrooms. Some rust around tub fixtures, shower fixtures old, and shower layout allows water to puddle in the bathroom floor. Food was excellent (but pricey) and the serenity and natural surroundings were fabulous. The hotel partnered with an excellent travel agency, Maritur, who arranged our airport pickups and two excursions. We had a wonderful time. If you can avoid their ‘meal plan’ (making it an all-inclusive), dining and drinks are much better when you are not on the meal plan. The room was big, private and very clean. The food is exceptional, fresh and upscale. The staff is very attentive. Wish there had been a group yoga class each morning. The spa was incredible. And the staff so lovely. Very spacious with a separate living room and heated pool. Not really a “dislike”, but the seaweed was the only thing keeping the beach from being perfect- and they were working hard to clean it up. The food was pricey, but the ambiance made it worth while! We loved everything specially the service!